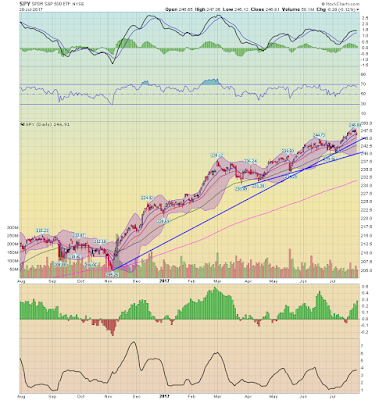 Once again, all stages of indicators are positive. Manufacturing jobs rose by 16,000 for an average of +5,500 vs. the last severn years of Obama's presidency in which an average of 10,300 manufacturing jobs were added each month. May was revised downward by -7,000. June was revised upward by 9,000, for a net change of +2,000. construction jobs increased by 6,000. YoY construction jobs are up 191,000.
temporary jobs increased by 14,700.
the number of people unemployed for 5 weeks or less decreased by -172,000 from 2,305,000 to 2,133,000. The post-recession low was set 18 months ago at 2,095,000. Overtime was unchanged at 3.3 hours. Professional and business employment (generally higher- paying jobs) increased by 49,000 and is up +580,000 YoY. the index of aggregate payrolls rose by 0.7 from 134.9 to 135.6.
the alternate jobs number contained in the more volatile household survey increased by 345,000 jobs. This represents an increase of 1,967,000 jobs YoY vs. 2,159,000 in the establishment survey. Government jobs rose by 4,000 .
the overall employment to population ratio for all ages 16 and up rose 0.1% from 60.1% to 60.2 m/m and is up +0.4% YoY. The labor force participation rate rose 0.1% m/m and is up +0.-% YoY from 62.8% to 62.9%. This was a solid report in both the headline numbers and the internals. Literally the only negative was the decline in coal mining jobs (a Trump promise that is so far going nowhere). Aside from that, the "worst" was that a few things like the unemployment rate were unchanged, and -- of course -- that wages are still pathetic for this stage of an expansion. But this month we can celebrate not just a good jobs number, but also a new expansion high in participation, nearly a new low in short term unemployment, a new low in those who are not in the labor force at all but want a job now, and the involuntarily employed part-time. Just a solid report. Along with corporate profits in the producer sector, the other two nonfinancial leading sectors are those consumer durable purchases of houses and motor vehicles. Consumers typically cut back on these before producers notice. Once they do, production turns down and a recession begins. This is the same idea behind noting that in the inventory to sales ratios, typically first sales turn before inventories turn -- it takes a little while for producers to take note of the consumer change in demand. With Tuesday's July motor vehicle purchase data, let's take a more detailed look at each. 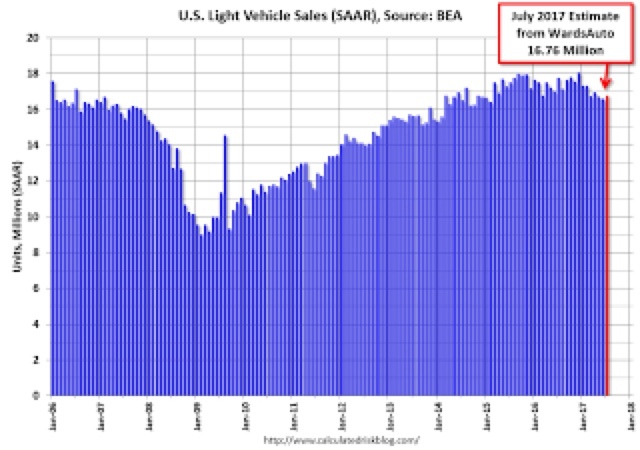 All this year, vehicle sales have been running between 16 and 17 million annualized. It would take a number below 16 million to be concerned that a consumer-led recession might be near. So the news here is mixed. The news on housing is similarly mixed, but again by most measures has backed off from its expansion peak. Single family permits made a peak in winter. Residential construction has now followed. It is important to note, however, that single family permits stalled at least twice before in this expansion, in late 2013 through early 2014, and late 2015, without signaling an economic downturn. Turning to the four typical monthly measures of the housing market -- permits, starts, plus new and existing home sales -- we see that total permits and starts, with the exception of Q4 of last year and Q1 of this year, have made no progress at all in two years. Existing home sales are up about 5% in the last two years. Only new home sales has grown about 10% YoY over the last 8 quarters. 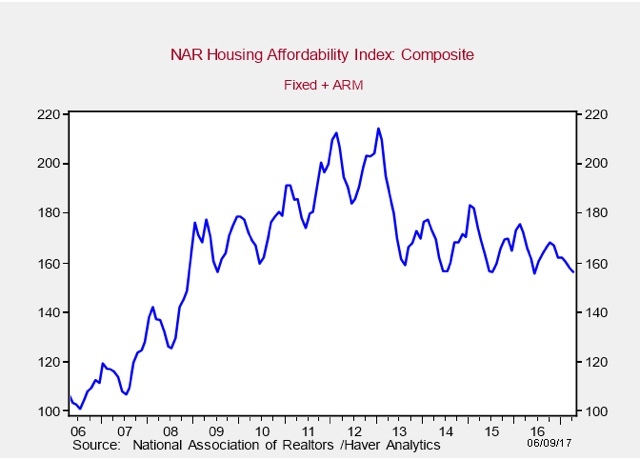 It appears that existing home sales are being affected by affordability. With foreign buying declining, I do not expect prices of new homes to continue to rise much further either. In summary, with the exception of single family new home sales, there is nothing in either of the two leading consumer sectors suggesting any positive input into the economy as we move into 2018. 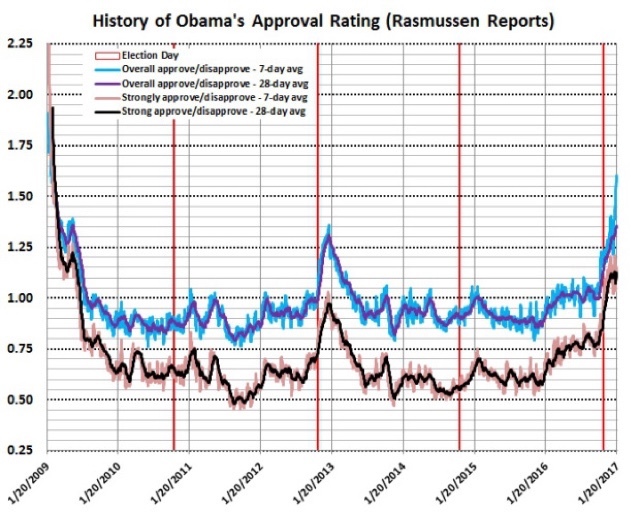 Obama had a 1:1 approval vs. disapproval spread on Election Day 2012 (vertical red line), and managed to win re-election. But on Election Days 2010 and 2014, for every 100 adults who strongly disapproved of Obama, there were only 60-65 and 55 adults who strongly approved of his performance -- enough for a GOP wave in each case. Worse for the GOP, the 50% strong disapproval means that if those people come out to vote, literally the GOP cannot win. 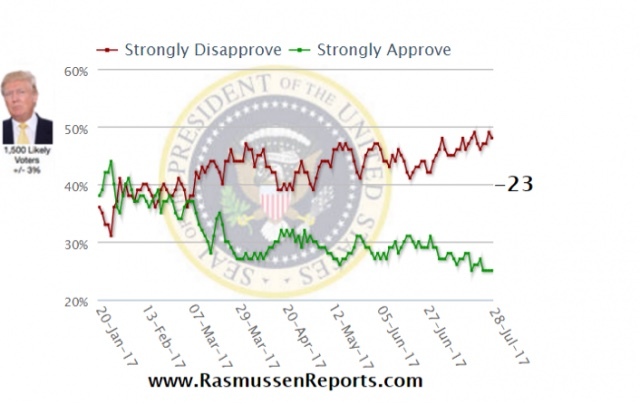 Rasmussen's index is only a nowcast, not a forecast, but if the polling 15 months from now is as bad as it is today, the GOP's only hope of not losing its House majority is its ruthless gerrymandering and voter suppression. While several of the long leading indicators have turned negative, a majority are still positive. 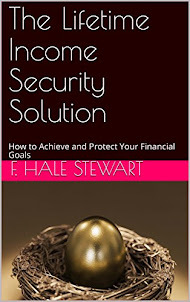 This investment blog is created and authored by F. Hale Stewart and is published and provided for informational and entertainment purposes only (collectively, the “Blog Service”), The information on the Blog constitutes Mr. Stewart’s own opinions. None of the information contained in the Blog constitutes a recommendation that any particular security, portfolio of securities, transaction, or investment strategy is suitable for any specific person. You understand that Mr. Stewart is not advising, and will not advise you personally concerning the nature, potential, value or suitability of any particular security, portfolio of securities, transaction, investment strategy or other matter. To the extent any of the information contained in the Blog may be deemed to be investment advice, such information is impersonal and not tailored to the investment needs of any specific person. From time to time, Mr. Stewart or companies he’s associated with may hold positions or other interests in securities mentioned on the Blog and may trade for their own account(s) based on the information presented. Mr. Stewart may also take positions inconsistent with the views expressed in its messages on the Blog. Mr. Stewart may hold licenses with FINRA, the SEC or states securities authorities and these licenses may or may not be disclosed by Mr. Stewart in the Blog. The investments discussed by Mr. Stewart may be risky and speculative. The companies may have limited operating histories, little available public information, and the accompanying stocks may be volatile and illiquid. Trading in such securities can result in immediate and substantial losses of the capital invested. You should only use risk capital (capital or money that you can lose all of), and not capital required for other purposes, such as retirement savings, student loans, mortgages or education. The Blog may be temporarily unavailable from time to time for maintenance or other reasons. Mr. Stewart assumes no responsibility for any error, omission, interruption, deletion, defect, delay in operation or transmission, communications line failure, theft or destruction or unauthorized access to, or alteration of, the Blog. Mr. Stewart is not responsible for any technical malfunction or other problems of any telephone network or service, computer systems, servers or providers, computer or mobile phone equipment, or software occurring for any reason, including but not limited to, on account of technical problems or traffic congestion on the Internet or at any site or with respect to the Blog or combination thereof, including injury or damage to any person’s computer, mobile phone, or other hardware or software, related to or resulting from using or downloading Mr. Stewart’s content in connection with the Web and/or in connection with the Blog. Under no circumstances will Mr. Stewart be responsible for any loss or damage, including any personal injury or death, resulting from anyone’s use of the Blog, or any interactions between Mr. Stewart and readers of the Blog, whether online or offline. The Blog may provide information from or links to certain brokerage companies for your convenience only. Mr. Stewart does not endorse or recommend the services of any brokerage company. The brokerage company you select (and not Mr. Stewart) is solely responsible for its services to you. MR. STEWART, HIS AFFILIATES, AND PARTNERS SHALL NOT BE LIABLE FOR ANY DAMAGES OR COSTS OF ANY TYPE ARISING OUT OF OR IN ANY WAY CONNECTED WITH YOUR USE OF THE SERVICES OF ANY BROKERAGE COMPANY. THE BLOG AND THE CONTENT ARE PROVIDED “AS-IS” AND MR. STEWART, HIS PARTNERS AND AFFILIATES, DISCLAIM ANY AND ALL REPRESENTATIONS AND WARRANTIES, WHETHER EXPRESS OR IMPLIED, INCLUDING IMPLIED WARRANTIES OF TITLE AND MERCHANTABILITY, IF APPLICABLE, AND FITNESS FOR A PARTICULAR PURPOSE OR NON-INFRINGEMENT. MR. STEWART CANNOT GUARANTEE AND DOES NOT PROMISE ANY SPECIFIC RESULTS FROM USE OF THE BLOG. MR. STEWART DOES NOT REPRESENT OR WARRANT THAT SOFTWARE, CONTENT OR MATERIALS ON THE BLOG OR ELSEWHERE ARE ACCURATE, COMPLETE, RELIABLE, CURRENT OR ERROR-FREE OR THAT THE BLOG OR ANY OF THE SERVERS USED TO OPERATE THE BLOG ARE FREE OF VIRUSES OR OTHER HARMFUL COMPONENTS. THEREFORE, YOU SHOULD EXERCISE CAUTION IN THE USE AND DOWNLOADING OF ANY CONTENT OR MATERIALS AND USE INDUSTRY-RECOGNIZED SOFTWARE TO DETECT AND DISINFECT VIRUSES. WITHOUT LIMITING THE FOREGOING, YOU UNDERSTAND AND AGREE THAT YOU DOWNLOAD OR OTHERWISE OBTAIN CONTENT, DATA OR OTHER MATERIAL FROM OR THROUGH THE SERVICE AT YOUR OWN DISCRETION AND RISK AND THAT YOU WILL BE SOLELY RESPONSIBLE FOR YOUR USE THEREOF AND ANY DAMAGES TO YOUR MOBILE DEVICE OR COMPUTER SYSTEM, LOSS OF DATA OR OTHER HARM OF ANY KIND THAT MAY RESULT. Mr. Stewart reserves the right to change any and all Blog content, software and other items used or contained in the Blog at any time without notice. Reference to any products, services, processes or other information, by trade name, trademark, manufacturer, supplier or otherwise does not constitute or imply endorsement, sponsorship or recommendation thereof, or any affiliation therewith, by Mr. Stewart. IN NO EVENT WILL MR. STEWART, HIS AFFILIATES, PARTNERS, MEMBERS, MANAGERS, DIRECTORS, OFFICERS, EMPLOYEES OR AGENTS BE LIABLE TO YOU OR ANY THIRD PERSON FOR ANY INDIRECT, CONSEQUENTIAL, EXEMPLARY, INCIDENTAL, SPECIAL OR PUNITIVE DAMAGES, INCLUDING FOR ANY LOST PROFITS OR LOST DATA ARISING FROM YOUR USE OF THE BLOG, OR ANY OF THE CONTENT OR OTHER MATERIALS ON, ACCESSED THROUGH OR DOWNLOADED FROM THE BLOG, EVEN IF MR. STEWART OR HIS AFFILIATES, PARTNERS, MEMBERS, MANAGERS, DIRECTORS, OFFICERS, EMPLOYEES OR AGENTS IS AWARE OR HAS BEEN ADVISED OF THE POSSIBILITY OF SUCH DAMAGES. NOTWITHSTANDING ANYTHING TO THE CONTRARY CONTAINED HEREIN, THE LIABILITY OF MR. STEWART AND ITS AFFILIATES, PARTNERS, MEMBERS, MANAGERS, DIRECTORS, OFFICERS, EMPLOYEES AND AGENTS TO YOU FOR ANY CAUSE WHATSOEVER, AND REGARDLESS OF THE FORM OF THE ACTION, WILL AT ALL TIMES BE LIMITED TO THE AMOUNT PAID, IF ANY, BY YOU TO MR. STEWART FOR THE BLOG IN THE IMMEDIATELY PRECEDING TWELVE MONTHS, BUT IN NO CASE WILL SUCH LIABILITY TO YOU EXCEED $1000. YOU ACKNOWLEDGE THAT IF NO FEES ARE PAID TO MR. STEWART FOR THE BLOG, YOU SHALL BE LIMITED TO INJUNCTIVE RELIEF ONLY, UNLESS OTHERWISE PERMITTED BY LAW, AND SHALL NOT BE ENTITLED TO DAMAGES OF ANY KIND FROM MR. STEWART, REGARDLESS OF THE CAUSE OF ACTION. On health care, is it time for "skinny improvement?" While I don't think the GOP assault on Obamacare is over for the long term -- for example, if they pick up at least a couple more Senate seats in 2018 -- the crisis appears to have passed for the moment. That being said, there are some significant problems with the Act as it stands. In particular, the individual market in a few states needs shoring up. And just about everybody hates the individual mandate for one reason or another.. Since the 3 Senate GOP dissenters, the few others who expressed severe doubts, and perhaps members of the GOP House's "Tuesday group," might be open to working with democrats, maybe there is at least some narrow ground for agreement to fix a few problems and make health care insuance better. codifying the Cost Sharing Reduction payments to insurers to stabilize the markets and preclude Executive caprice. replacing the individual mandate with an automatic payroll deduction, or self-employment tax, for those not covered by employer healthcare or a chosen individual plan. The payments in the automatic deduction could qualify the individual for Medicaid, or perhaps go to a bronze plan insurer, e.g., the lowest priced plan in the employee's state. establishing a catastrophic insurance fund for exceptional cases, such as the Iowa boy whose $12 Million annual bill has singlehandedly caused all of the insurers to flee the market in that state. allowing a Medicare buy-in for those age 62-64. Of course, to enact "skinny improvement" both Ryan and McConnell would have to permit it to come to a vote, even though a majority of their respective caucuses would presumably be in opposition. And to assure the President doesn't use his veto, we would probably have to name it something like the "Donald J. Trump Healthcare Enhancement and Obamacare Repeal Act." But if doing nothing is not an acceptable option, then "skinny improvement" looks like the narrow way forward. About half of renters spend more than 30 percent of their income on rent, up from 18 percent a decade ago, according to newly released research by Harvard’s Joint Center for Housing Studies. Twenty-seven percent of renters are paying more than half of their income on rent. This is a serious real-world issue. I have been tracking rental vacancies, construction, and rents ever since. The Q2 2017 report on vacancies and rents was released last week, so let's take an updated look. After stopping for a year, in the second quarter median asking rents zoomed up over 5% from $864 to $910. Meanwhile, surprisingly weekly wages declined from $865 to $859.. The combined effect is that rent has become more unaffordable than ever. 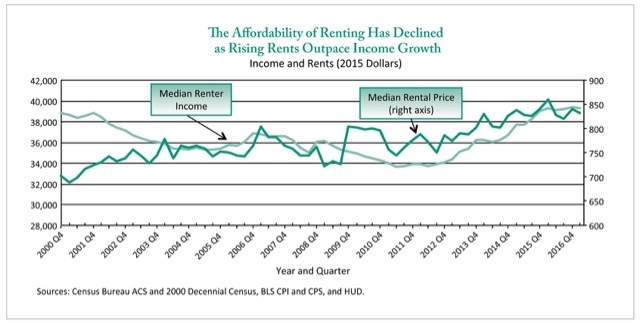 Like the median household income data, this shows renters' income bottoming out in 2011-12, and rising since relative to rents as calculated by the ACS. I'm not sold on HUD's method, mainly because it relies upon annual data released with a lag. In other words, the entire last year plus is calculated via extrapolation. I suspect we could get much more timely estimates using Sentier's monthly median household income series, compared with the monthly rental index calculated by Zumper. 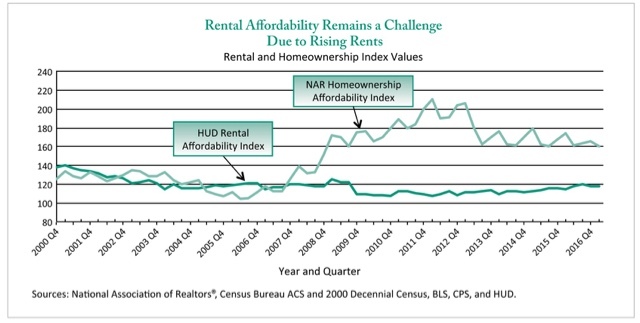 It will be interesting to see if HUD confirms the Homeowner Vacancy Survey's jump in UNaffordability when it releases its Q2 data soemtime later this quarter. 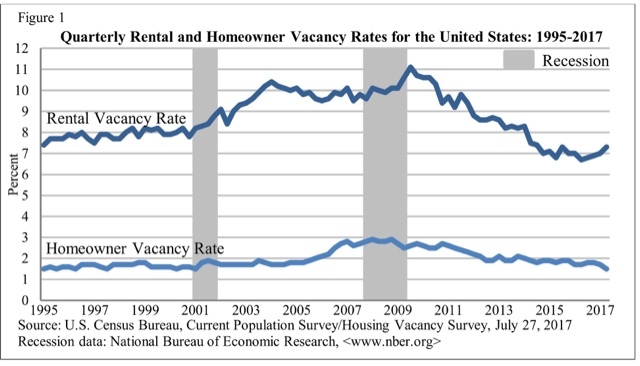 The takeaway from this quarter's report is that, while the crunch in vacancies has probably passed peak, the "rental affordability crisis," which had appeared to be abating at least a little, has come back with a vengeance. Unlike several weeks over the last few months where pieces of the economic releases were moderately weaker, this week’s news was solid. Second quarter GDP rebounded from its weak first quarter pace, the housing market remains in good shape and durable goods orders increased (although transportation orders had a great deal to do with this number). As for the markets, second quarter earnings season is well underway and results have been positive. The markets have reacted accordingly moving modestly higher. As has been the case however for the last 24 months, the market remains expensive meaning upward movement is constrained by the combination of high PE ratios and revenue growth. On Friday, the BEA released their first estimate of second quarter GDP, which grew at a 2.6% annual rate. This was a marked improvement from the 1.2% annual growth rate of the first quarter. Personal consumption expenditures (PCE’s) provided a noticeable boost: after increasing a paltry 1.9% in the first quarter, they rose a far more robust 2.8% in the second. A big reason was the turnaround in durable goods purchases which grew 6.3% in the second quarter compared to a slight contraction in the first. Investment only increased 2%, thanks to a 6.8% decline in residential spending. But nonresidential structural investment also fell from its first quarter reading of 14.8% to 4.9%. Intellectual property investment was only up 1.4%. But whatever the weakness of certain internal components, the 2.6% growth rate and a welcome change from yet another weak first quarter GDP reading. These were up 0.8% M/M and 9.1% Y/Y (left chart). 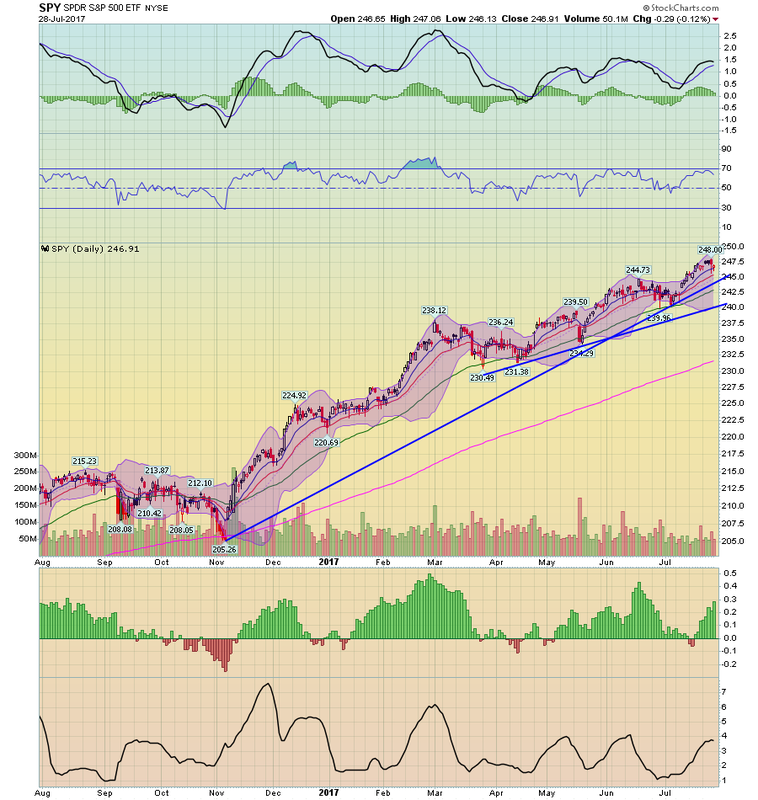 This market has been in a solid uptrend since the summer of 2014. New home builders clearly learned their lesson from the bubble; for the last four years, they have maintained a steady inventory relative to demand. (right chart). Sales were down 1.8% M/M and up 0.7% Y/Y (left chart). Sales have been between 5.5 million and 5.7 million units/year for the last year. Part of the reason for the slowing sales pace is the constrained inventory situation (right chart). Inventories relative to sales have been trending lower for the last four years. The top two graphs show total new durable goods orders (the absolute number is on the left; the Y/Y number is on the right). The overall number could finally be moving through the $240 million dollar level that has contained this release for the last two years. But the middle chart shows that core goods decreased slightly. This sub-index – which is a barometer of business demand – is still fairly weak and today’ release did nothing to dispel that characterization. The bottom chart illustrates that transportation orders are the primary reason for the increase. This headline number will likely decrease in the next few months, bringing it back within the $220-$240 million-dollar range. Economic conclusion: this week’s news was very encouraging. GDP rebounded to 2.6% largely thanks to an uptick in consumer activity. Housing is growing modestly and durable goods orders ticked higher. As of now, we’re on track for better growth in the third quarter. Market overview: earning season is well underway and results are positive. According to Factset.com, revenues are up 5.2% and earnings have risen 9.1%. The same numbers for Zacks are 3.4% and 8.8%. These results are fortunate because the market is expensive: the current and forward PE ratios for the SPYs and QQQs are 23.94/25.75 and 18.94/21.45, respectively. Also remember that corporate profits are an important long leading indicator; these results point to continued growth in the next 6 to 12 months. This week’s market’s results highlight why I dislike the Dow. While it was up 1.16% -- largely thanks to the disproportionate influence of several key stocks -- broader averages rose far more modestly. The SPYs were up .01%, while the QQQs fell .19%; the IWMs were the big loser, dropping .59%. The S&P 500 rallied strongly after the election. Over a four-month period, the SPYs rose from a low of 205.26 to 238.12. But since then, the index has been grinding higher in a “two steps forward one step back” manner. This shouldn’t be surprising. The post-election rally was fueled by the hope a unified Republican government would deliver lower taxes, regulatory reform, and more fiscal spending. The market is slowly absorbing the bitter pill that this probably won’t happen as advertised. But the economic environment is perhaps more important than the political, and that points to modest growth and -- thanks to a weaker dollar -- stronger exports.